Pole length: 19.68" (500mm). 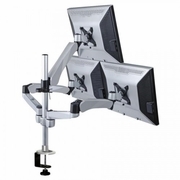 Expandable to support 4 monitors. Quick mount & quick release designs at three connecting points: stand, spring arm and monitor end. Solid Aluminum die-cast construction; 7.87" Height adjustment; Space saving with its compact design; Easy installation and dis-installation.